On 2 and 3 December 2017, Formula E, the world’s premiere electric street racing series, will roar back into the Hong Kong with two full days of world-class racing. This will be the second ePrix Hong Kong will host and will kick-start Formula E’s fourth season. The Hong Kong ePrix 2016 was the first time in over 30 years that the City hosted a premier motorsport event and achieved what many thought would be impossible – hosting an international open-wheel, single-seat racing event in the heart of Hong Kong. 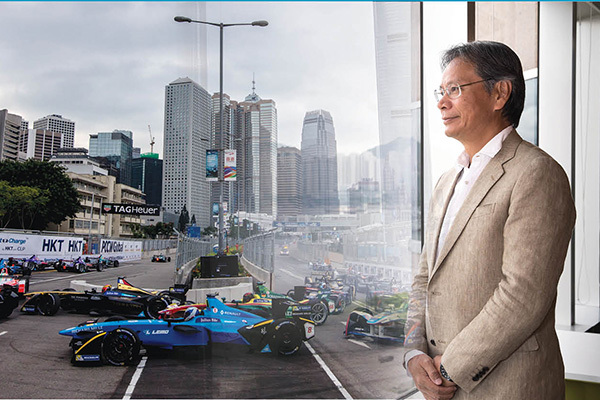 In anticipation of the Hong Kong ePrix 2017, Kenneth Ng, President of the Hong Kong Automobile Association and Chairman of the Formula E Working Group, as well as Former Law Society Council Member, speaks to Hong Kong Lawyer about his involvement in the Formula E Hong Kong ePrix 2016, the upcoming race and his hopes for e-racing in Hong Kong in the future. 1. Can you tell us how you became involved with the Hong Kong Automobile Association and the Formula E Working Group? Before I retired, I sat on committees of several NGOs, including the Hong Kong Automobile Association (“HKAA”). I have always had a passion for cars. Last year, when Formula E first came to Hong Kong, the HKAA was the technical supporter of the event and, as an HKAA General Committee member actively involved in the race preparation, I was appointed as the Chairman of the Formula E Working Group, overseeing a range of operational matters. 2. What type of work went into pulling off the first ever Formula E Hong Kong ePrix? What were some of the challenges of introducing the race in Hong Kong? Motor racing has no priority in Hong Kong as it is still perceived as a rich man’s game. Against that background, it did involve a few years’ effort in persuading the Government to appreciate that this is good for Hong Kong. One can imagine, and appreciate, their reluctance in endorsing something which has no precedents in Hong Kong – a street race like Monaco or, closer to home, Macau. Once we had the Tourism Commission’s policy support in hand, the coordination for approvals/licenses from the various Government departments should have been all downhill. However, that is not the way it unfolded due to the lack of precedents. I am so glad that we pulled this off and in the end all of the Government departments were happy with the way the event turned out. 3. In a previous issue of the journal, you said “Hong Kong needs more positive energy these days and we hope that [the first Formula E Hong Kong ePrix] is just the beginning!” What else do you have in the works? The HKAA has been working closely with the Homes Affairs Bureau to build an e-racing track within the compound of the Kai Tak Sports Park. We have been told that our track design will be included in the tender documents available to the bidders for consideration. This is a giant step. Longer term, we are lobbying the Government, LegCo members and political parties to support our proposal to build a permanent multi-purpose motorsports circuit at the proposed reclamation off Sunny Bay in Lantau Island. We have no desire to compete for land, which can be used for building houses, hospitals, schools etc., but that piece of reclamation has already been designated for recreational purposes, as opposed to residential, due to the sound pollution caused by aircrafts. However, this will be a very long and uphill battle. 4. What car(s) do you drive outside of work? Are any of these electric cars? Any favourites? I am very old fashioned and l like the normal combustion engine, and the raw sound it produces. I don’t have a favourite car – or I don’t have a favourite car for long – as I seldom own a car for more than two years. In Hong Kong, most people do not need cars to commute as our public transport systems are so good. Cars, to me, and I am sure to a lot of us, are just toys. Suffice it to say, I always keep more than one car, with one of them having a manual gear, which gives me a lot of driving pleasure. 5. What’s your take on the future of electric vehicles globally and in Hong Kong? 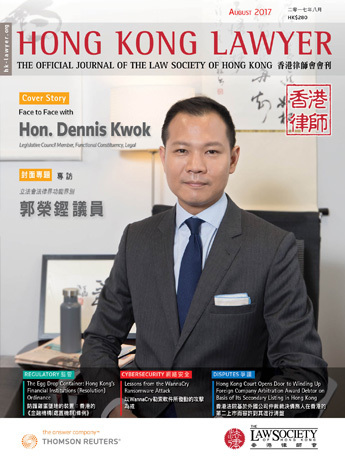 It is definitively the future in Hong Kong, and if not for the reduced concession introduced recently by the Government, the future likely would have come earlier. It should be a global trend too, but I cannot speak for every country as electric cars still have issues to overcome (eg, recharging, and thus are not so reassuring for long distance driving). 6. How did you go from law to automobiles? What relationship do they have in your mind? I did not actually move from one to the other, and there really is no relationship, as I see it, between my work in each area. However, if we were to talk about motorsports and the law, then I can see the relationship. I have been a Racing Steward for several years. Last year, I was the National Steward for the Formula E Hong Kong ePrix. Judging the rights or wrongs of drivers as a Race Steward is similar to judging cases in a court of law as racing is a rules-based sport. Although stewards cannot normally reserve judgment because penalties, such as drive through penalty, stop-start penalty etc, will have to be imposed during the race and cannot normally wait until the race finishes. 7. If you were Elon Musk, what would you do? I would be very busy figuring how to spend the huge amount of money I have earned and may not have time to attend this interview. On a more serious note, I think I would leverage the high profile I had gained to push as hard as possible for the concept of smart mobility/smart city or autonomous driving. I believe this will be the ultimate solution to traffic congestion, which all major cities in the world are all trying to solve to no avail. 8. What happens if the Hong Kong Government withdraws the subsidies for electric vehicles in Hong Kong – what impact may this have? It will undoubtedly slow down the environmental protection process. I question the wisdom behind the recent move by the Government, which does not sit well with the overall environmental policy. If the government feels that there are “enough” electric cars on the road in Hong Kong and therefore withdraws or reduces the tax concessions, what does it expect prospective car owners to do? It is not wrong, but a little unrealistic, to expect them to think from a high moral ground for the global environment when picking their next new car. As I said, it is not wrong, but just unrealistic.